Pavé would like to thank Handspun, Clément and Laekhouse for supporting our coverage of the 2011 Tour de France. The 2011 Tour de France will see arguably the strongest North American contingent in the history of the race as 4 riders with top-10 finishes on their resumes will toe the start line on Saturday. Canadian Ryder Hesjedal and Americans Christian Vande Velde, Chris Horner, and Levi Leipheimer all hope to improve on their previous successes and perhaps make a run at a podium position. 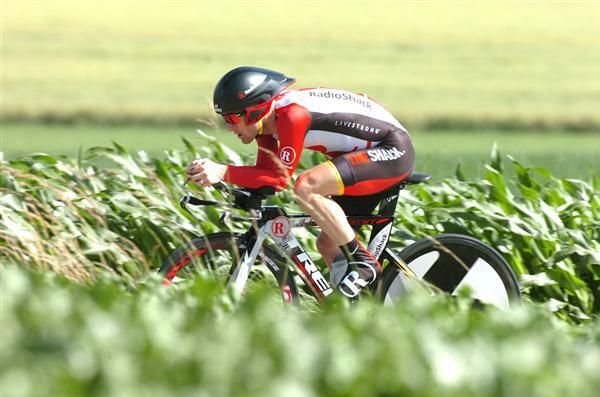 Radio shack’s Leipheimer is North America’s best shot at a podium finish in this year’s Tour. The often overlooked Californian, has seven top-10 grand tour finishes since 2001, including a third-place finish in the 2007 Tour de France. More importantly, his results have been steadily improving this season with an 8th overall at Paris-Nice, 2nd at the Tour of California, and a somewhat surprising (albeit boring) win at the Tour de Suisse. Lacking the uphill acceleration of favorites Alberto Contador and Andy Schleck, Leipheimer will have to rely on experience and a generally calm demeanor to take advantage of any opportunities he can find to gain time on his rivals. Backed by a strong team, including fellow American Chris Horner, Germany’s Andreas Kloden, and Slovenia’s Janez Brajkovic, Stage 2’s TTT could be Leipheimer’s first—and best—opportunity to put some time into the likes of Schleck and Contador. That said, should Leipheimer slip, watch for the 39-year-old Horner to climb his way to another top-10 finish. One of last year’s Tour surprises, Garmin-Cervelo’s Ryder Hesjedal, will have his work cut out for him this year. His biggest threat to overall success will probably come from within as Christian Vande Velde tries to rid himself of the bad luck that cost him his 2010 Tour and dampened his 2009 campaign after his impressive fourth overall in 2008. In 2009, Garmin did put two riders in the top-10 (Bradley Wiggins and Vande Velde), but if Vande Velde and Hesjedal are both on form it could lead to a rather interesting intra-squad battle. Jonathan Vaughter’s fluid team model will be under pressure in the sprint finishes as well. Tyler Farrar is back to his winning ways and seems to be inching closer to his (and the team’s) first Tour stage win. The question is can he and Thor Hushovd work together, putting their personal ambitions aside for the sake of the team. Stage 1 seems almost tailor-made for Hushovd, but the rest of the flat stages are right up Farrar’s alley. With changes to the green jersey competition, Garmin could employ a unique tactic that sets-up Hushovd for the intermediate sprints and Farrar for stage wins. More importantly, having two top-tier sprinters will keep the likes of Petacchi and Cavendish on their toes. One of the most compelling stories of this year’s tour will also be written by BMC’s George Hincapie, who’s making his 16th Tour start, tying Joop Zoetemelk’s record. Here’s the kicker: Zoetemelk finished all 16 Tours, while Hincapie abandoned his first in 1996. So, Hincapie will only tie Zoetemelk for most finishes with his final Tour next year. Big George’s role this year will be a familiar one for the American: do everything to help team leader Cadel Evans. As the second-most experienced rider on the team, Evans’ success will hinge heavily upon Hincapie’s first lieutenant role. On the opposite end of the spectrum, Americans Tom Danielson and Tejay Van Garderen are making their Tour debuts. For Danielson, his first Tour shot may be his last, as his career has been a roller coaster ride since he was first labeled “the next Lance Armstrong”. Danielson will have his time to shine in the high mountains this year and if the Tour de Suisse was any indication, he could be one of the last men standing when the GC contenders make their moves. For Van Garderen, his debut Tour comes on the heels of a steady progression and will be our first real look at a champion of the future. Van Garderen finished 8th in 2008 and 2nd in 2009 at the Tour de l’Avenir—the “baby” Tour de France. In 2010 he finished his first grand tour by placing 35th in the Vuelta. He shouldn’t have much pressure placed on him, which is the perfect way to develop young talent. Finally, a trio of TT specialists will look to make their mark at this year’s Tour in the TTT and breakaways. Former U23 World TT Champion Danny Pate will play a major role if HTC-Highroad wins the Stage 2 TTT. Meanwhile, Garmin-Cervélo boasts Dave Zabriske while BMC has the services of Brent Bookwalter, who is becoming somewhat of a short TT/Prologue specialist and will surely help Evans in a variety of ways. Man of the Hour: At 37 year’s of age, Levi Leipheimer is most likely riding his final Tour as a legitimate podium threat. He has an experienced team at his side and if he can limit his losses in the high mountains, he may be able to replicate his 2007 success. With master-tactician Johan Bruyneel behind the wheel, anything can, and will, happen. On the Hot Seat: Ryder Hesjedal will try his best to avoid being another victim of the Garmin top-10 sophomore curse. Hesjedal has remained very diplomatic as far as leadership roles are concerned, but Garmin’s notoriety for producing one hit wonders has to weigh heavily on his mind. His teammate Christian Vande Velde is right next to him on the Hot Seat though, as he tries to replicate his own 2008 and 2009 Tour success. Up-and-Comer: HTC-Highroad’s Tejay Van Garderen will make his Tour debut this year amid a lot of talk from the American media. Van Garderen has proven that he deserves this opportunity, and although it is a learning experience for the young American, I expect him to spend more than a few days in the white jersey—especially if HTC wins Stage 2. And, who knows, if Tony Martin falters, Van Garderen could be given the opportunity to step-up to the big time. This entry was posted in Featured, Races, Teams and tagged 2011, BMC, bookwalter, danielson, garmin-cervelo, hesjedal, hincapie, horner, leipheimer, pate, preview, radio shack, tour de france, van garderen, vande velde, zabriskie. Bookmark the permalink. Joop Zoetemelk, indeed a hardman for finishing all of his 16 TdF participations. Maybe he learned it from his first team, Flandria, where he rode with the Brothers De Vlaeminck and Van Marcke, under the iron fist of Briek Schotte.